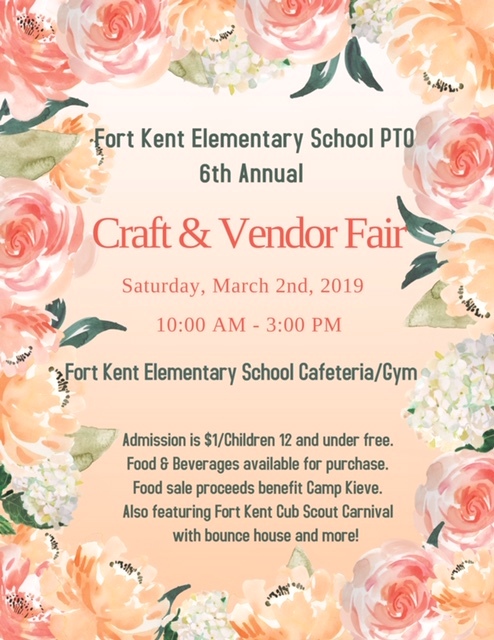 Fort Kent Elementary School PTO 6th Annual Craft & Vendor Fair will be held Saturday, March 2nd at the Fort Kent Elementary School Cafeteria/Gym from 10 AM – 3 PM. Admission is $1 at the door. Children 12 and under are free. Also featuring Fort Kent Cub Scout Carnival with bounce house and more!